An interesting day at Hellviktangen’s farmers market this weekend. A lot less people came, likely due to the rain, but the ones who were there were very keen on hearing details about the products that I had available. One item that brought about great interest was my seasoned salt. Such a simple ingredient to have on hand and it can be used on so many ways. Throughout the growing season, while everything is fresh and abundant, I do my best to preserve what I can. One of the methods I use is dehydration. My pantry is full of mason jars with a huge variety of dried goodness in them. 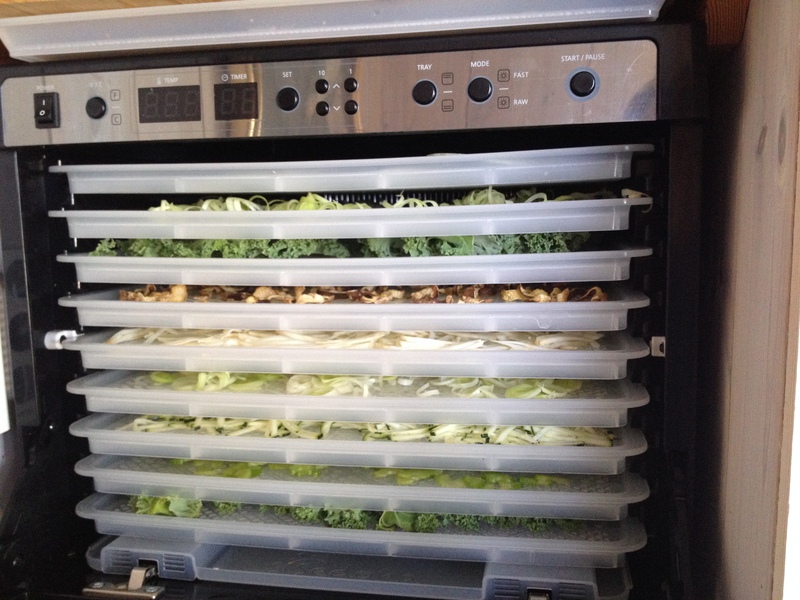 My trusty mandoline which has been well used for over a decade makes quick work of the task, and once thinly sliced, I place everything in the dehydrator and let it go to work over night. I dehydrate at no more than 40C (104F) in order to maintain the optimum nutritional value. While I do not adhere to the Raw Diet, I choose to use this process for dehydration regardless (one need only be patient). The same holds true for drying other items like Calendula (see my post on salves). Once thoroughly dry, I store it all in clean jars in the pantry. 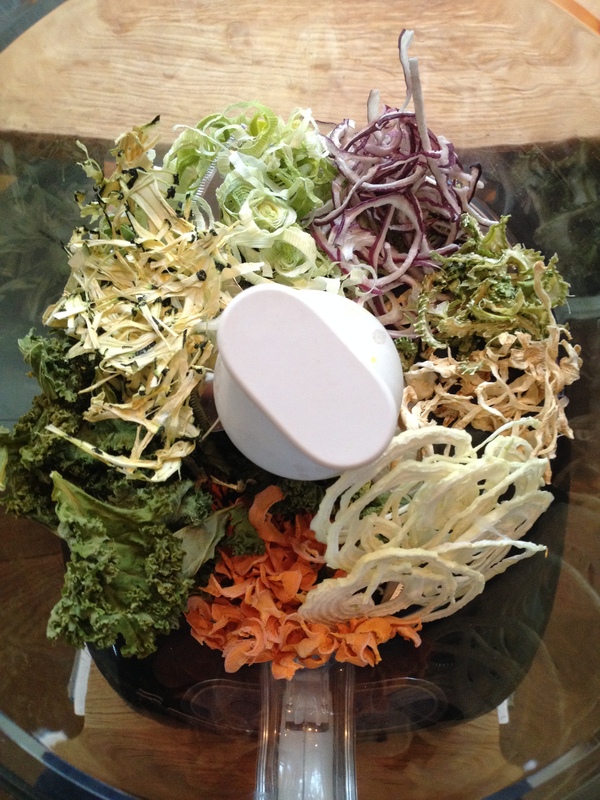 Now, what to do with all of your dehydrated vegetables? So many things, and you need to do it before your children eat them all! Mine raid the pantry often 😉 One way that I like to use them in to make a seasoned salt. I use my food processor to grind them up. Note: some say that you may damage your processor in doing so and recommend a proper grinder, but going in small batches has never been a problem for me. 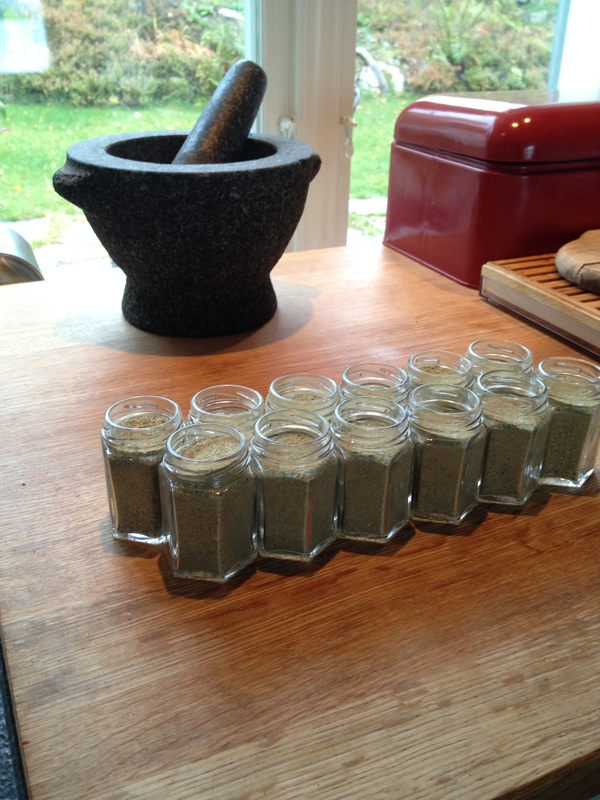 Once ground into a powder, I add dried herbs and salt. I happen to purchase 25kg bags of organic sea salt, as I use it for brining, fermenting and pickling. You can use whatever salt you prefer. Once it is ready, package it as you like or leave it in a salt pot by the stove to have on hand to toss into soups, rub on meat, sprinkle on pizza or anywhere else you need a punch of flavour.